Isn’t this bridal bouquet so dreamy?! In fact, all the floral details throughout this New Jersey wedding at Lake Valhalla Club couldn’t be any more romantic! Seeded eucalyptus, ranunculus, hydrangea, roses, lisianthus, and dinner plate sized dahlias are a few of the flowers that are giving us all the heart eyes, along with pretty paper designs, ethereal golden hour lighting, bistro lights and a mountain setting nestled within 108-acres offering picturesque lakeside views. The entire celebration was planned to perfection by d’Luxe Events and captured through the lens of Cody Raisig Photography. See our favorite moments below. 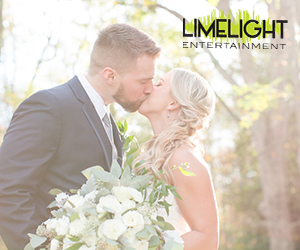 From d’Luxe Events…Liz and Dustin’s wedding day was full of romance, laughter, rustic elegance and a very packed dance floor! From the very start of the day, happy tears and fun were being had as Liz and her sister and best friends all got ready at Liz’s childhood home. The bride and her bridesmaids all wore gorgeous bohemian flower crowns, and the maid of honor was set apart with a flowing chiffon floral printed gown. Liz did not let her best guy friend sit on the side lines …instead she had a Bridesman at her side. The ballroom was adorned with bistro lights, farmhouse tables and lush garland greenery. The outdoor ceremony overlooking the lake was personalized perfection with details and live music that everyone enjoyed. Instead of displaying the wedding cake on a table, Liz and Dustin opted to set it atop a vintage dresser, with drawers overflowing with wild blooms and loose greenery. Guests sipped pink lemonade, enjoyed mini milkshakes and mini root beer floats…and end of the night donuts to go capped off the fabulous food.